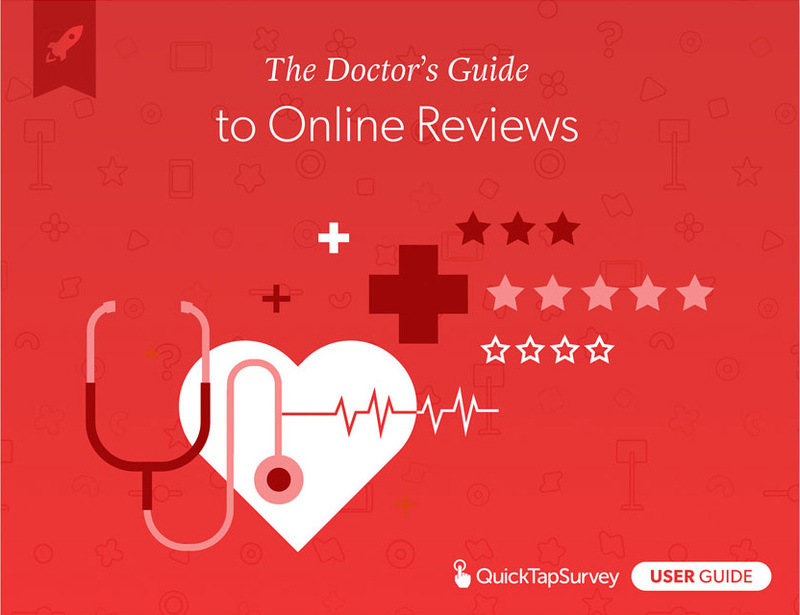 Doctors today are increasingly rated and reviewed online - the good and the bad. If you’ve suffered from a bad review you’ll know the pain associated with receiving feedback publically. While five star reviews can drive new patients to your doors, bad reviews can keep them from coming. So how do you manage this and leverage this to benefit your business? This guide walks you through everything you need to know about how to manage your online reviews. In the following pages we help you navigate the world of online marketing and show you why the relationship between your website, how you rank on Google and your online reviews is important. We also show you how you can leverage mobile technology to create an automated customer feedback system to proactively generate more positive reviews as well as alert you to unhappy patients to prevent bad ones. Lastly we introduce you to simple marketing tactics you can execute with a patient’s email address including email marketing, and how to use Facebook custom audiences to attract more customers, keep your current customers & grow your business. 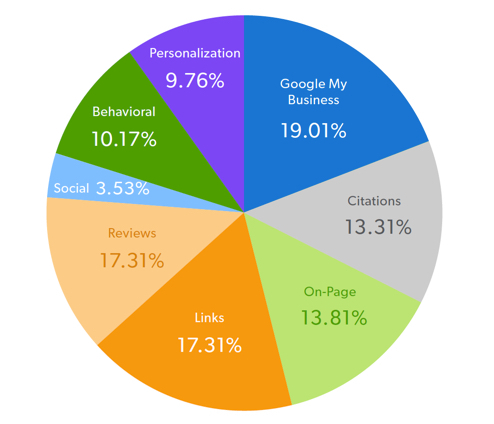 Even if someone else built your website it’s important to understand how Google ranks you. In this section, we introduce you to SEO (i.e. how you rank on Google) and help you understand why some of the most important elements for search engine optimization happen on your own website. We also show you why Google reviews are fundamental to your success. Together they make up the foundation that your credibility is built on, so be sure to get these basics in place. What does your website do for you? Does it help you drive more patients through the door? Is it easily found on Google? How does it rank against competing clinics? Optimizing your site for search engines builds credibility for your business, helps you maintain a great reputation, and drives traffic to your website. A high ranking SERP (Search Engine Results Page) should be the number one tactic in your digital marketing plan, because websites on the first page of Google receive 95 percent of web traffic. So how do you go about achieving this? Let’s start at the beginning. First things first: What is “SEO”? 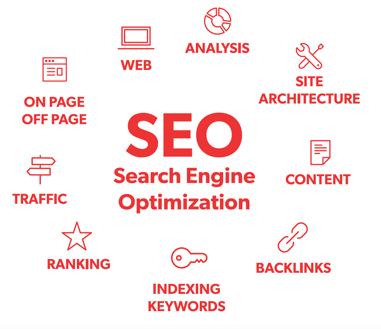 Search engine optimization (SEO) is a series of activities that make it easy for your business to be found on a search engine. Every time you search on Google, the search engine’s algorithms determine which sites are displayed based on what you search and where you are. Search optimization just means telling Google who you are, where you are and what keywords you should rank for. For example: if I search for “Best Dentist near me”, Google will display what it thinks are the ‘best’ dentists near my location. What Google wants: To provide the most relevant search results for its users. What Google wants from you: Make it as easy as possible to find your website and rank it higher than similar relevant websites. There are two factors that have an effect on your website’s search rankings. They are known as on-page and off-page SEO. On-page relates to the technical setup of your website and consists of all of the elements of SEO your website development company can control best. Off-page, on the other hand, takes skill and strategy because it has to do with continuous link building and social promotion - perfect for someone in-house to manage. Off-page is critical because each five star review and brand mention creates a link to your website and sends a signal to Google to rank you higher in the search results. Tip: Automating your online reviews strategy can take away the bulk of the work here. Search engines work by using algorithms to evaluate websites by topic (or keywords). Search engine ranking is the position at which a website appears in the results of a search query. 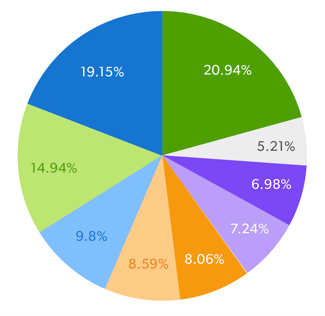 This MOZ* ranking chart shows the importance of a multitude of factors that impacts your ranking on Google. *Moz is a Seattle company that sells inbound marketing and marketing analytics software. They write a fantastic blog on SEO and inbound marketing. Google uses over 200 ranking factors in their algorithm. Although no one is sure what all of them are, we do know not all of them are equally important for higher rankings. 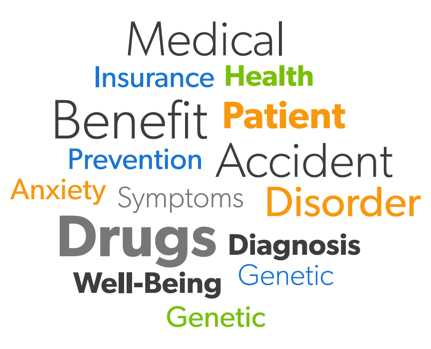 Online patient reviews are highly regarded, ranking just after My Business, NAP/Citation, On-Page Signals, and Link Signals in importance – all of these factors are well within your control. What are the elements of good On-Page SEO? Researching the right keywords for your clinic is vital for your on-page ranking. Start by creating a high and medium priority keyword list and write SEO optimized copy throughout your site incorporating both. Including your target keyword in strategic places on your web page like in your headline, page title and url sends a message to Google that your website is about that keyword. One trick to assess the relevance of a keyword is to look at keywords used by your competitors and using PPC (google ads) to learn what keywords convert to actual sales. Tip: Instead of picking keywords with a high search volume (eg. doctor), switch your focus to keywords with a low to medium search volume as it will be faster to get to the top position here. Short tail keywords (single words eg. 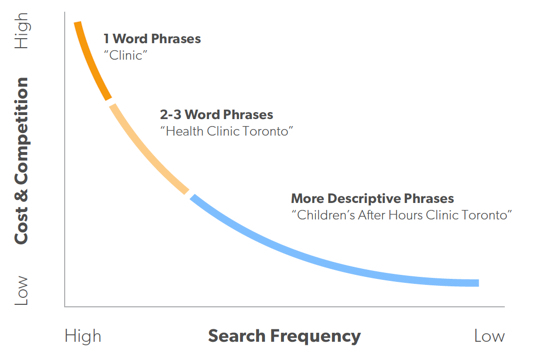 health clinic) and long tail keywords (phrases eg. urgent care clinic toronto 24 hours) depend on several factors such as where you’re located, what services you’re going to promote and what terms patients typically use to find you and your competitors. This refers to the website architecture, page speed and mobile responsiveness of your website. Every page on your website should be easy for search engines to crawl and index. Elements like headers and meta description must be looked at not only from an SEO perspective, but for visitors to easily consume the information you’re presenting. If people like a page, search engines are very likely to rank it. By tightening up your menus and reducing link clutter, your pages will be better structured. And when information can be found easily, visitors tend to browse longer. What are the elements of good Off-Page SEO? Google sees online reviews as a genuine measure of the quality of a business because Google sees them as trusted source. Feedback surveys are an effective tool to boost your online reviews. An automated customer feedback machine at your practice can increase your chances of getting reviewed online by as much as 200%. On pages 25-31 we show you how to use technology to collect, interpret and action customer feedback. Blogging is a cost-effective off page tactic because unlike the rest of your website, a blog gives you a way to constantly update your web presence with fresh content that is typically crawled by search engines. While a blog is a great way to provide all forms of educational content, you should write what your audience is searching for because the only thing Google loves better than fresh content is content that answers the search queries of their users. 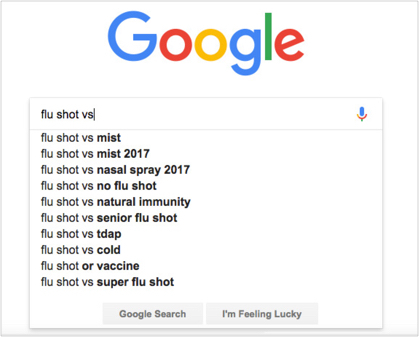 Tip: Remember searchers are not just looking for a general “health clinic” they are looking for someone to treat a burn, examine a skin rash, prescribe antibiotics, give them a flu shot etc. Tailoring your blog content (and keywords) to include these phrases can help bring people to your website who are more likely to seek your services. Tools: Use Google Autocomplete and Google Related Searches for content ideas. How do I get to the top and stay there? Local search engines love online reviews. Your review quantity, frequency and quality play a huge role in how you’re ranked. In addition, reviews build backlinks to your site which search engines use to determine your popularity and ranking. With mobile internet users outgrowing desktop users speedy, mobile friendly websites are a must. Analyzing your website with free tools like Google’s PageSpeed and Think With Google will help you identify areas to make your page faster. Ensure that you’ve got an active blog or social media presence, where you are interacting with followers. Got a negative online review? Respond immediately to boost patient confidence and show that your business values feedback. Here’s how you can easily find your Titles, Meta Descriptions, and Headers to verify they are set up properly for SEO. Local search is the ability to perform geographically contained searches and is designed to help people find services within a reasonable distance from where they are. Results are delivered in one of two ways - either based on your typed query (eg. Toronto Dentist), or the search engine will auto-detect your location based on your IP address. 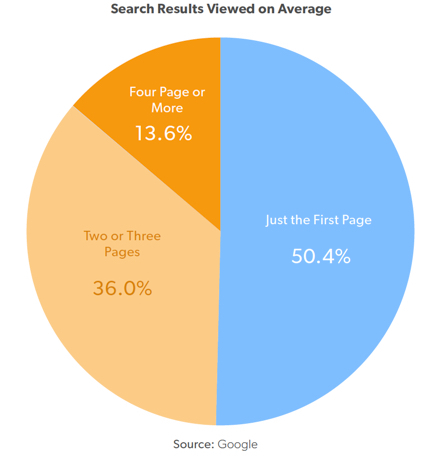 More than one third of all searches and more than half of mobile searches have a local intent. This means 8 in 10 people who search for a local business will convert within just a few hours - making local SEO one of the best marketing investments you can make for your dental practice. Below is a sample Google search for the search term “Dentists in Downtown Toronto.” The area highlighted in blue are organic search results. The area at the top in pink is Google paid advertising. 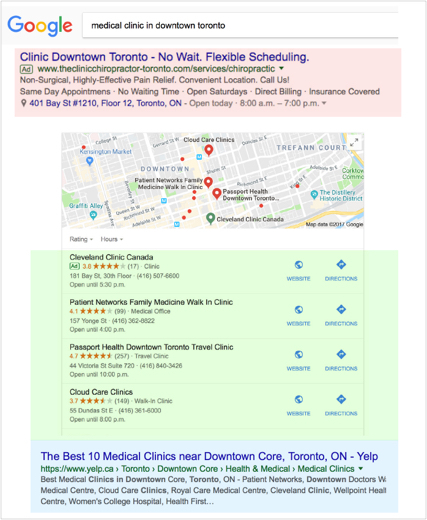 The “local pack” just below the paid ads and just above the first organic result is the area in green and is the most coveted spot for businesses with a physical address. Patients looking for an dentist in Downtown Toronto generally want to find dentists with not just good ratings, but who are also nearby. Local SEO is important because without it potential patients in your area are going to find your competition. There are many factors that influence local pack and organic search rankings. Everything we talked about in the previous section on website optimization applies, but first you need to claim your local business listing. How to claim a local business listing? 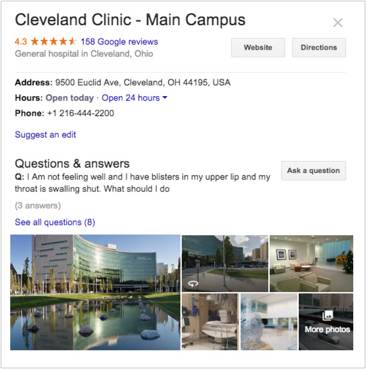 QuickTapSurvey customer Cleveland Clinic is a great example of a clinic with an optimized profile, meaning they have provided Google with considerable data about themselves. To boost your Local Search rankings, first decide how you want to be represented online, then use that format everywhere starting with your GMB listing. Just remember the more information you provide Google, the more likely you will appear in search results. Maintaining a consistent NAP (business name, address and phone number) is critical for businesses wishing to rank high in organic search results. 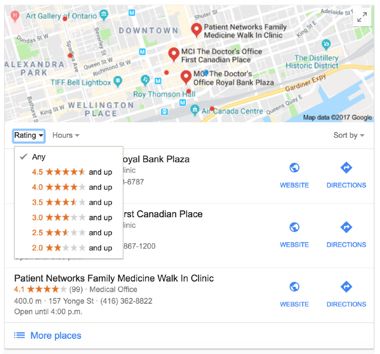 Using the same format on your website and your GMB is important because Google takes the information into account when determining which companies to display for geo-targeted searches, like “Dentists in Downtown Toronto”. Go even further by including keywords within your description, selecting all appropriate categories for your business, and adding images and video to show off your facilities. You can even include useful information such as parking locations and the types of payment your practice accepts. Google loves online reviews because customers love online reviews. A major factor in determining how high you rank locally is the quantity and quality of reviews and ratings. If a business has 100 reviews and they are all 5 star ratings, then that’s going to tell Google that the business is very popular. Once you’ve established a consistent NAP format it’s a good idea to find business listing directories online where you can publish your NAP listing. A link from any credible site that is relevant to your industry will be helpful. Google will view these two listings differently, although they are clearly the same company to us. To claim your free listing, visit the GMB website here. Changes you make on your listing will update across Google Search and Google Maps. A word about Google’s local 3-pack Also known as snack pack, Google’s 3-pack is dependent on location and listings are ranked according to the proximity of the searcher. At the end of the 3-pack however is the ‘more places’ button which opens an expanded view of more businesses. Here’s where it gets more competitive. Once someone taps this, they are no longer making a decision based on proximity, rather the star rating of the business. As a recent addition, you can sort listings by ratings even before you hit the ‘more places’ menu. Likewise, reviews are now a filter for Maps results too. All this showing the importance Google places on online reviews. 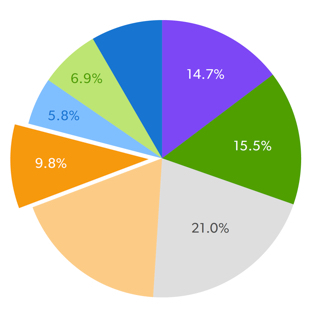 Every year, Moz publishes a comprehensive Local SEO Ranking Factors report. Here is the graph from 2017 that categorises overall ranking factors. Do Consumers Go Beyond Google Page 1? Research shows online reviews impact more than half of consumers buying decisions. One aspect of claiming your GMB listing on Google is that it gives patients the ability to write reviews about your practice. This is amazing if patients are only leaving positive reviews - but as we know, this isn’t always the case. Negative reviews are detrimental to your business on all levels, especially search. This is why it’s essential to have a system in place that flags negative feedback at the point of experience where the business has the ability to act immediately, before the patient has had the chance to go online. What is your current reviews acquisition strategy? If email is your go-to reviews tactic, you’re not alone. With email, however, comes a whole host of problems including the lack of personalisation, deliverability issues and presumed motivation on the part of the customer to actually click through to a third party review site. Furthermore since your database is likely filled with happy and not-so-happy customers, a blanket email to everybody is a tardy approach. Not only is it asking a lot of your customers, it may very well lead to a damaging review that’s hard to recover from. What if you could still use email, but spend less time and effort on it plus achieve a higher conversion rate? Automating the whole review and ratings process at meaningful touch points can help you do that. When you set up a customer feedback machine in your practice, you are not just measuring customer satisfaction but you are actually achieving it. Once you understand the customer experience you can start to turn feedback into actual SEO gains that will grow your business organically in a way no paid ad campaign can. There are obvious benefits for the customer too, no more spammy solicitations that ruins the customer experience. Why do patients even leave reviews? Managing your online reputation is like a team sport. You have to be offensive and encourage satisfied customers to share their experience, and at the same time be defensive so you are intercepting negative reviews before they are posted online. The main reason why clients leave negative reviews is because they have no clear avenue for feedback following the experience, or even worse the feedback was provided to the wrong person and was never acted on. So how do you give your patients a clear avenue for feedback and assure that the feedback gets to the the right person? 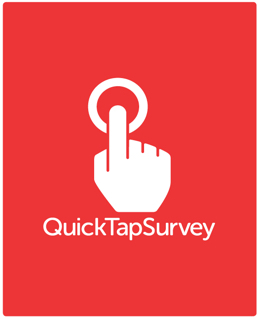 Sign up for QuickTapSurvey and choose Kiosk as your survey type. 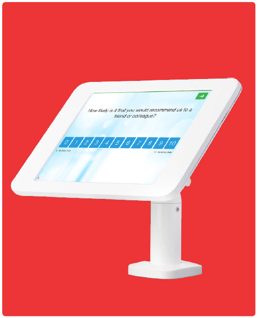 Kiosk mode lets you lock the device down so users can not navigate away, which is especially helpful if the kiosk is going to be in an unstaffed area. 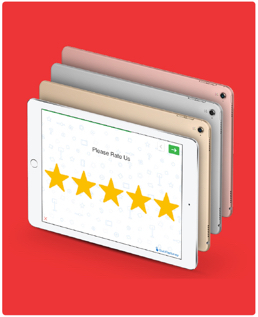 Select the Dental Satisfaction + Reviews survey template and customize it by adding your logo, brand colors and autoreply email. With autoreply emails you can instantly reach out to clients who had a positive experience, by incentivising them to share their experience online with a direct link to your Google Reviews page. Preview and publish your survey. Turn on response notifications which are triggers to automatically notify you when a user indicates they had a negative experience at your clinic. You can have these notifications sent to the clinic’s manager or administrator and they can instantly reach out to the patient to deal with their complaint. Download the survey to one or more tablets. You can house them in a kiosk enclosure or simply set them up on a stand. You’re now ready to start collecting more feedback and more reviews. a message is created to automatically pipe in the First Name ($qts:answer1$), Last Name ($qts:answer2$), and Email Address ($qts:answer3$). According to a survey conducted by Dimensional Research, an overwhelming 90 percent of respondents who recalled reading online reviews claimed that positive online reviews influenced buying decisions, while 86 percent said buying decisions were influenced by negative online reviews. In Part One we discussed why customer reviews are important for local SEO. Reviews equal trust and that means increased clicks or CTR (click through rate). Since Google’s entire reason for being is to deliver a quality search experience to its users, the company continues to reward businesses that invest in their reviews strategy. But what about other forms of feedback from your patients? These could be via an email, by phone or through your website. From understanding patients’ needs to learning flaws in your existing setup, there is virtually an endless list of uses for patient feedback. Here are three ways to analyze feedback and make it actionable. Prepare a list of areas you can attribute each review to. For example, appointment booking, wait times, treatment, price, billing, courtesy, availability etc. You may even want to include a category for each staff member. It pays to be specific. For each main category, try and identify specific characteristics or sub-categories during analysis. For example, appointment booking - by phone, online, in-person - this will make the assessment easier, and will also allow you to extract more information from the reviews. Sorting feedback into categories will immediately help to show a wider picture of how the patient views your practice. Group all feedback in one centralized location, preferably a spreadsheet, and give each comment a score. Give a positive score +1 for each positive comment, -1 for each negative, and 0 for neutral mentions. With the spreadsheet ready the results can be easily aggregated to show a pattern and track sentiment change across time. Each spreadsheet entry should also include information such as how long the patient has been a customer, how much they spend, date the feedback was submitted, and the source of the feedback. Once the data is in a spreadsheet you will be able to easily parse the results and represent it graphically. The graph will represent at a glance areas that need to be improved, and where your service matches or exceeds expectations. The analysis should also extend to identify features driving patient satisfaction (eg. Cable TV in Wait Rooms), which can serve as a guide for future improvements. Looking at individual feedback, you might find particularly strong opinions or complaints. Key Strengths = what patients loved the most. You should be proud of these and use them in your marketing often. Key Flaws = Improvements that must be implemented as quickly as possible. Now that you have done this, you can create a summary of patient feedback and discuss this with the appropriate team that can take action on the feedback. One of the most powerful things you can do with patient feedback is to create a Top 10 list of issues that you can then use to inform your roadmap and benchmark against the competition. Whether positive or negative, you need to close the loop with all patients who took the time out to say something. What to do about negative reviews? Offer a genuine apology and ask how you might help resolve the issue. Your first reaction can help you gain insight into what went wrong and, if you’re lucky, what would make it right. Show the patient that you are attempting to solve their problem. Once complete, offer to make up for their bad experience by giving them something with an attached monetary value. Demonstrate what steps you have taken to prevent the problem from occurring again. Data suggests that nine out of ten times, a patient will continue doing business with you if you let them know their voice was heard. Additionally, when you delight your patients by exceeding their expectations, your patients will be motivated and excited to share, what has now become, a positive story. 5. What to do with the emails you collected? Five things you can send to your email list. Frequently employ online surveys to learn more about your patients and to understand their changing preferences. This is the simplest way to build real relationships with patients. Did you just win an industry award? Do you have a testimonial or review worth sharing? Are you attending an important conference? All it takes is one credible name to create quality shareable content that builds greater levels of trust. This can be an ebook, whitepaper or even the breakdown of a jargon laden industry research report addressing a topic or pain-point your audience cares about. Presenting yourself as an expert is one of the best uses for an email list. Go one step further and segment your list first so you are only delivering hyper relevant information. For example, a patient interested in OTC cold medication may not want information pertaining to the flu shot. Your email list can provide incredible word of mouth advertising for your brand. Always include share-on-social-media and forward-to-a friend links in all emails. Promote exclusivity by offering patients something they can only get from you. Social media contests are one of the best ways to increase engagement, get more followers and drive new business. 6. What to do with the customer data you collected? With over a billion people logging into Facebook every day, the platform is a great way for your dental practice to attract new patients. 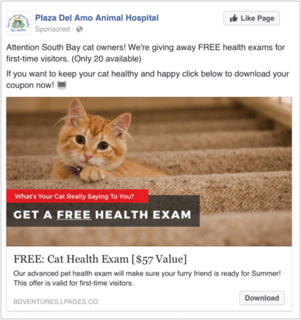 While most dental clinics have already claimed their Facebook page to grow their community, many do not take advantage of Facebook’s advertising products. Facebook ads, with its sophisticated targeting capabilities, is one of the most cost-effective ways to advertise your services to specific user demographics in your location. By showing highly relevant ads, people are more likely to click on them, leading to a higher CTR (click-through rate). And because its Facebook, people are more likely to like and share your ad with their friends, giving your practice a free advertising boost. With the right behavioural and demographic targeting, you can reach people who may need dental treatment near you for as little as $1/day. 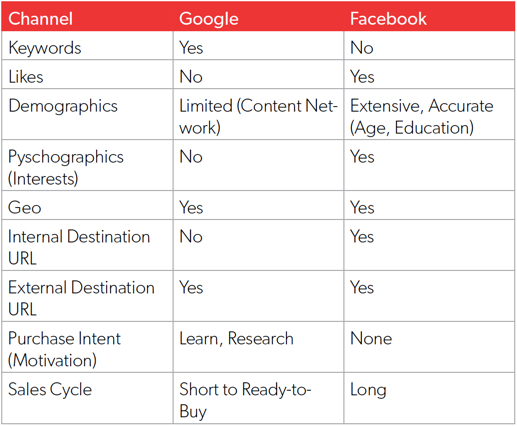 Facebook Ads and Google Ads: What’s the Difference? While both are effective in getting new patents in the door, they are different because they target different audiences. Eve just adopted a cat and posts the news as a ‘life event’ on Facebook. You can target people just like Eve using Facebook Ads. Eve has a sick cat. 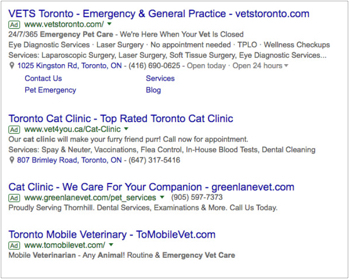 She performs a Google search for “emergency cat clinic toronto”. Google pops up your ad. Your audience selection is broad. This requires a large budget. Audience Details: Your audience is defined. Location: Ontario, Canada. Your audience is too specific for your ads to be shown. Try making it broader. Choose the age, gender, language and location of the audience you wish to target. Choose specific interests that may be important to your audience. Use the search box and Facebook will suggest matching or related interests. Choose an audience based on income, purchase behaviour, mobile devices traveling habits etc. Connections allows you to target ads to people who are connected to your Page. For example, anyone who has a friend connected to your page will see your ad, with their friend included (ex: “Jon Snow likes this page” will appear above your ad). Upload a list of current patients and Facebook automatically matches this data with their users. Once you have your Custom Audience list you can decide what percentage of your potential audience you can target, or exclude, in future ad campaigns. A good Facebook page can instill confidence in new patients and help you engage with old ones. Once you’ve set up a page you’re happy with, try the following tactics to move the needle. Get your Facebook page verified to rank higher in Facebook search results. Add a call to action on your page. “Call Now” or “Book Now” are good options. When you have a really good blog post, pay to boost the post to increase its reach. Photos, videos and contests are ideal for boosting. Add Partner apps and services to let patients book appointments with your clinic. Facebook reviews tabs can be used to highlight and respond to patient reviews. Facebook Live is great for organic reach and is also an exciting way to retarget your audience with a video campaign. Utilize Facebook WiFi to display checkins whenever a patient enters your office. When patients check in on Facebook, a post appears in their news feed, saying they’re at your business. Use appointment cancellations to boost last-minute promotions on your page. Use Facebook Stories’ Snapchat like filters and effects to drum up your followers’ interest. Similar to Instagram Stories, content shared to Stories will appear at the top of your Facebook news feed. customer data to generate new leads. The very last thing we want to leave you with is perhaps the most important of all - measurement. Without measurement, there is no marketing. One of the best things about online marketing is there’s no shortage of data available. The metrics you choose to focus on will depend on your specific goals, but the important thing is to move beyond vanity metrics and focus on results that impact your financial bottom line. Your reporting should demonstrate how multiple marketing channels are working together to reach a common goal. We recommend that you start with Google Analytics which can tell you everything from web traffic to visitor demographics to audience behavior. Google Analytics can also effectively track which campaigns brought you the most traffic and conversions. The first metric you should track are your keyword rankings, to see which keywords you’re ranking for in Google and how much traffic each of those keywords are generating. You can do this with Google Search Console. You should also track your website visitors and overall webpage traffic. This is best done with Google Analytics. Lastly, you should set up goal tracking within Google Analytics to track your conversion metrics such as ‘number of appointments booked’. You’ll want to track how many of those conversions can be attributed to your SEO efforts. A data dashboard is a great way to track multiple data sources and have them all display and update in real time. Just remember, online marketing efforts like creating an optimized website or getting to the first page of Google don’t happen overnight. When you look at your weekly analytics, focus on small wins and build on them.